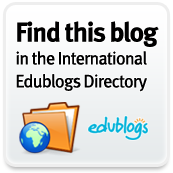 The 2008/09 Wikipedia for Schools is a recent initiative which offers free, hand-checked, non-commercial selections from the regular Wikipedia which are useful for English speaking students because articles are targeted around the UK National Curriculum. The project is designed to help the education of poor and rural communities in India and Africa. SOS Children UK, in coordination with the Wikimedia Foundation wanted to make the content free for those areas which lack Internet access. SOS Children, a British charity allows for downloading onto a DVD which can store the 5500 articles; it is equivalent to a twenty volume encyclopaedia and has 34,000 images. Unfortunately, due to the size and scope of the project it was not possible to check the reference and external links for each article, so they are not included. As a librarian, that makes me a bit dubious of the whole thing since we teach our students to always look at the references and external links. Readability statistics are for articles is another area for concern when using this in an educational setting. In the few articles I checked for readability, the average reading score was grade 11. As an educational tool, this would limit the use to high school students. In an effort to make the articles uniform, the editors did not seem to be thinking about low reading levels in high poverty areas. That being said, it's a noble effort with good intent. California is the first state to offer high school students free, open-source digital textbooks for high school math and science. Will we see other states follow California’s lead in digital textbooks? As California goes, so goes the nation. Does that mean we'll all be bankrupt eventually? As usual, the devil is in the details. 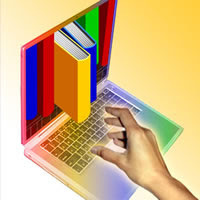 Read more about the California open-source digital textbook initiative. TweetGrid - A Quick "How To" from Jeff Turner on Vimeo. It's worthwhile for breaking news. TwitVid - @kathyschrock Video says it all! 30 Twitter Tips for Teachers | Blogging & Technology | So You Want To Teach? Twazzup: Search twitter. Get real insights. Will Barnes and Noble eReaders unseat Amazon's market position? Barnes and Noble is promoting new, freely downloadable e-reader software for ebooks which works on iphones, Blackberrys, MACs and PCs. The recent bad press on Kindle erasing titles from customer's individual readers, such as 1984 and the large cost of the Kindle may make the new offerings from Barnes & Noble seem attractive. 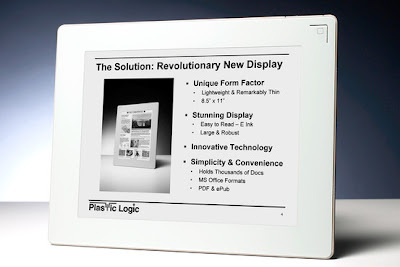 According to a WSJ article today, the maker of the Plastic Logic eReader device due in early 2010 is partnering with B & N and it will offer more than 700,000 titles, including more than 500,000 public domain books from Google Inc. and will continue to expand its offerings. Depending on the price point of the new ereader, they could make serious inroads to Amazon's market share. Earlier this month, members of an internet safety task force released these recommendations to improve cyber safety. Additional information and links regarding Online Connections can be found at this page, compiled by New Trier librarians in support of a parent program held earlier this year. In honor of the 40th anniversary of the Apollo 11 landing on the moon, check out these websites. One, called We Choose the Moon, is a real-time, interactive recreation of the mission sponsored by the JFK Presidential Library and Museum (it may load slowly and it is very visual/graphic intense with numerous links to explore). Another is 40th Anniversary of Apollo 11 from the Smithsonian National Air and Space Museum where we found this image and many more. A few interesting facts: in 1969, the US median income was $8,389; a first class stamp cost 6¢; gas was 35 cents a gallon and the New York Times best seller list included: Love Machine (Susann); Portnoy's Complaint (Roth); Godfather (Puzo); Ada, or Ardor (Nabokov); and Slaughterhouse-5 (Vonnegut). Do you remember the moon landing? Today’s Wall Street Journal includes an article discussing e-books: “Book Smarts? E-Texts Receive Mixed Reviews from Students”. It raises some question about the technology -- such as ability to highlight and post notes -- and about the cost needing to be lower relative to traditional print textbooks. However, many schools (including California K-12 and several colleges) and publishers are continuing to experiment with this technology. We will hear more about this option in the future. "Five teams of librarians — dressed in costumes ranging from Vikings to Elvis Presley — competed for the coveted gold book cart. They marched in drill-team formation, equipped with metal book carts." Do you think we should get a team together for competitions in the future? Check out this explanation of microblogging from JISC, a UK education and research community. Each available guide on Web2 Practice consists of a short animated video explaining the key concepts, supported by a more in-depth overview of the topic, including potential uses, risks and how to get started. Other video explanations on Social Media, RSS, Collaborative Writing, and Podcasting are also available. I've been investigating the Ning called English Companion which was created as a virtual place for English teachers to meet and help each other. One of the threads talked about teaching MLA citations. It provides several ideas of how to actively demonstrate this to students. I particularly liked Mark Childs' suggestions and his conclusion that "essentially, I find that making the students be a reader of the works cited page makes them a better writer of one." Something for us to explore next year. Looks like we'll start the new school year with teaching the MLA 7th ed. updates as Noodle Tools will be incorporating those changes at the end of July. 3. 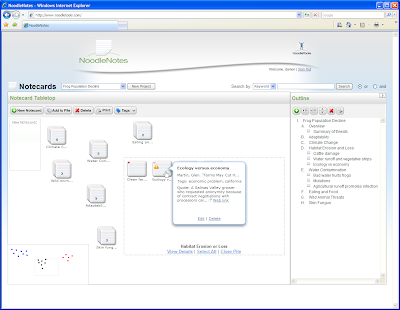 Notecards update --see the Noodle Tools blog to view dramatic changes in the Notecards feature. Looks pretty slick and more student friendly. I think they will like the outline feature and the ability to "populate" the outline by dragging notecards. With over 21 million flashcards, contributed by thousands, organized by tagging, these web-based tool has become a study aid to "absorb information efficiently and permanently". View this Internet application where you can create, study, print and download flashcards.